Villains run amok, Alfred has more hard luck, Julia is chucked, and the city is proper f--- you get the picture, many little pictures in sequential order in this week's forty-seventh issue of its weekly Batman ruckus. And while I'm still clutching the pages screaming into them, "JUST SHOW LINCOLN MARCH ALREADY, WE KNOW HE'S BEHIND THIS! 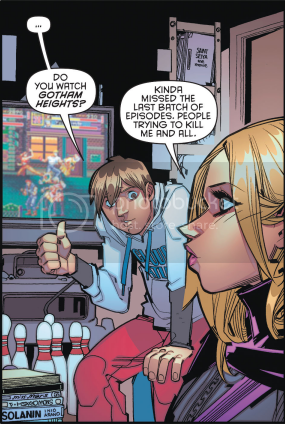 ", this issue does seem to at least waste my time entertainingly, with the Bat crew taking on the well-stocked baddies while Batman makes his way back to the city (though if I were him, I'd call a few members of the Justice League for extra help). He's been held up by a steel rod. 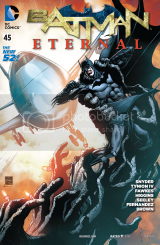 Is Batman Eternal? Or is it just taking an eternity to get to Lincoln March, the obvious villain behind all this? Lord Death Man mocks, Ra's al Ghul talks, and the villains have stocks in this forty-sixth entry in DC's weekly Batman decompression exercise. Though while my patience is waning, I didn't mind seeing Batman putting the pieces together, even if he got the wrong picture based on recent events. 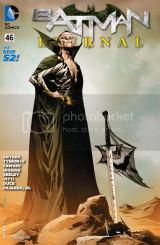 It's always good to see Ra's al Ghul, anyway, who enjoys messing with Batman's head about his legacy, and what villain knows Batman as intimately as Ra's (heh, aside from his daughter!)? 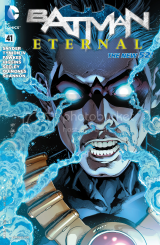 And he's not the only immortal in this issue! Mr. 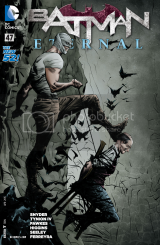 Bygone's a host, Batwing judo chops ghosts, and Harper abandons her post in this spooky, ooky, and pretty freaking goofy forty fifth in the increasingly meandering (but still worthwhile overall) weekly Batman title. Jim Corrigan interrogates Professor Milo with his fist, but of course Milo was transferring his credits from chemistry to necromancy, and he can't do that mid-semester. Harper tries to talk some sense into her new suburban blond friend. 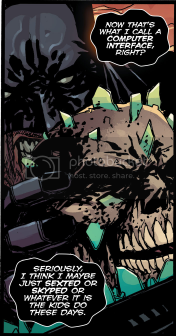 And Batman discovers that The Demon's Head has been diversifying his portfolio. But come on, writers. We know who's behind this at this point, and it ain't the Middle Eastern immortal with the Fu Manchu. "I'm trying to get on a plane heah, ya chowdahead!" Professor Milo's out of school, Batman fights ghouls, and Steph acts the fool in the underwhelming forty-fourth installment in DC's usually good weekly Batman tome. Ah, the supernatural part of this storyline. I thought you'd been put to bed with the destruction of Arkham and Jim Corrigan's exorcism of Maxie Zeus. If only it was. 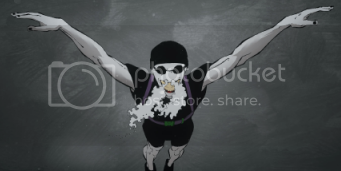 But unfortunately, we return to all the ghost crap because Batman recalls that Milo (now a professor appearing in the Gotham Academy book) was involved in that whole haunted Arkham situation with Deacon Blackfire, and Milo's coincidentally making his way to a plane out of town. I guess his students don't have to complete all their homework. Steph's in the lair of the Cat, where the two of them chat, they're joined by the Bat, and Harper thinks Steph's a brat, all in this forty-third installment of DC's weekly Batman serial. Cullen is recovering and back home, which is also where our fair haired ninja girl is staying now. 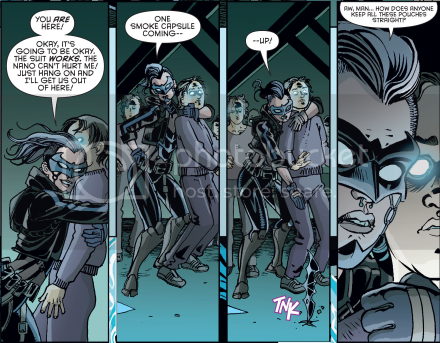 Selina has a little theory about her loyalty to her father and Harper thinks she's just being stubborn (look who's talking, girl). And aside from some of the weird noses, David Lafuente's art combined with the coloring makes for some great visuals, and a good issue becomes even better because of it. Is that Streets of Rage? 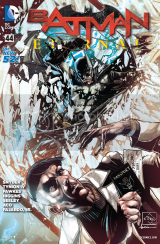 Last week, writer Scott Snyder and artist Greg Capullo's Batman (vol 2) #38 came out, and much controversy is being made of a revelation made in the final pages concerning everybody's favorite killer clown, Joker. Apparently, the Joker is, it seems, immortal! Jim Gordon shot him several times in the previous issue, killing shots that he nevertheless shook off. But what really freaked Batman out was when he confronted D-list villain Crazy Quilt, who revealed that the Harlequinn of Hate had a special chemical in his spine similar to a substance in certain jellyfish that induces cell regeneration. Pictured: A thing that does not happen until the next issue. 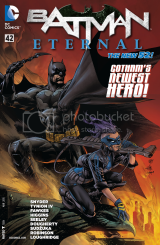 Bluebird attacks, Hatter's back on the rack, Batman gives a smack, and Steph fades to black in this forty-second (don't panic) issue of DC's weekly Batman hootenanny. We discover that Mrs. Brown has awful taste in decor, vigilante action is harder than it looks, Batman's had enough of his rogues piling on, and Tim's pity party isn't bullet proof. Bluebird's action debut is a comedy of errors... or is it action of errors? Whatever it was, it was still very awesome. Who can keep track of all those pouches? Not me. A bird of blue debuts, nanomachines imbue, the Bat-Family looks screwed, and Steph gets out-kung-fu'd in this forty-first entry in DC's ongoing weekly Batman parade. We finally see what that final push that makes Harper Batman's newest partner is. We get the inclusion of yet another Batman rogue (who I should have seen coming), the comradarie and contentions both between Tim Drake, Barbara Gordon, and Jason Todd, and Harper's fateful decision. What we don't see, however, is Batman! Eh, it's all right, we've seen a lot of him lately.